This is a special extended Course with 4 extra training hours. Easy stroll from London Kings Cross St Pancras and Euston. We are in the heart of Kings Cross at a beautiful tranquil healing centre. We are condensing this 2 and a half days in to 2 for this special extended certificated laughter yoga training course will give you the tools and techniques to get you started running laughter yoga workshops for groups. You can also start a community laughter club which is an ideal way to gain experience. We have added an extra 4 hours to this course although this will be achieved across the 2 days!!. I am very excited about this new training format which will allow you to be better equipped right from the start. 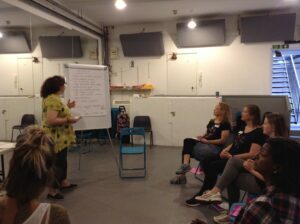 In this special extended course you will also get to plan and co-lead a live laughter class with members of the public so you will get to use what you have learnt right away! You can participate in this as much or as little as you like, no pressure but the opportunity is there. The laughter yoga leader certificate will enable you to obtain insurance for leading laughter yoga workshops with groups. The certificate is endorsed by your trainer/s and Laughter Yoga International University. 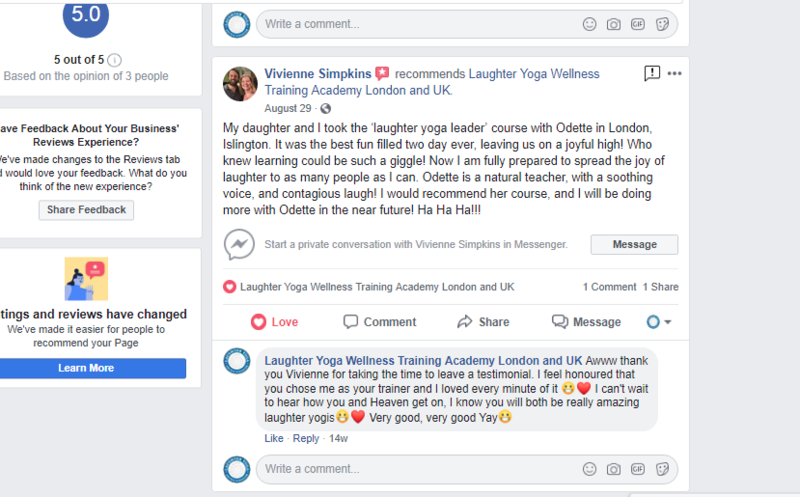 You will also receive membership to our private LYWUK Support Network on facebook for our Laughter Leaders where you can connect with other Laughter Yoga Leaders and Teachers and inclusion on our google map of laughter yoga classes. Registration: Please secure your place by way of payment. You will receive confirmation and details once booked. Pre-requisite: Ideally having participated in a Laughter Yoga class previously. Please contact Odette for details of her laughter classes or another that you can attend prior to training. If you have any questions regarding this please speak to us. If there is no opportunity to attend a class prior to training please call to discuss suitability and options before booking. It comprises of two days of Laughter Yoga Leader Training as originally outlined by Dr. Madan Kataria, Founder of the Laughter Yoga Movement plus an extra 4 hours of training allowing you to go deeper and learn more. Also you will plan and co-lead your first class. Please note I exclusively offer my students an opportunity to practise and gain experience at my laughter class in Archway. This is as an ongoing opportunity subject to availability as it will help you gain experience and increase your confidence to start your own club/classes. Depending on your previous experience in working with groups, you may need a little extra helping hand to get you started. Course Material and exclusive Extras! Extra 4 Hours = extra time to go deeper and learn more. Laughter Yoga Leader Manual plus exclusive content from laughter yoga wellness training academy. You will receive both a PDF and ring bound manual in a handy handbag size. Regular in person support opportunities and access to private members forums. exclusive opportunities to gain experience in London with Live Groups! Support via our private facebook group. At the end of the two days you will, upon successful completion, receive a Laughter Yoga Leader certificate enabling you to get appropriate insurance in order to run laughter workshops as well as allowing you to call yourself Laughter Yoga Leader. To reserve one of the limited spaces, please provide full payment in advance. The venue is in Archway at Hargrave Hall. Just a few minutes walk from the Tube and around 15 minutes from Euston. Fee for this extended program with extra 4 learning hours! Odette, our founder and Laughter Yoga Teacher/Trainer. She has a background in various Holistic Therapies including Laughter Yoga, Laughter Facilitation Skills, Energy Healing (Reiki Master), Sound Healing ( Gong Master) and Mindfulness and Meditation teacher. Known for her caring nature which includes random acts of kindness and offering a warm heart, a pair of socks and a woolly hat and conversation to homeless people. She works full time running her wellbeing and training company, Laughter Yoga Wellness London and UK and London Gong. Going further back, Odette worked a 9-5 in I.T so she is a shining example that change is possible. She has worked with Charities, Community Groups, Banks, NHS, Media Companies, Cancer Patients, Homeless People, Universities and more. From private parties to Small, Medium and Multi National Corporations. Laughter Yoga has been life changing for Odette and now she wishes to spread the joy by training others to connect with more joy and laughter. Course fees are not refundable although a course may be transferred to a friend who fits the training criteria. Please contact us if you wish to transfer your space. Full Terms and Conditions will be sent to you when you make your booking. All courses require 4 participants minimum in order for the training to go ahead. Please check with us before making travel/accommodation bookings. We are not responsible for any out of pocket expenses you may have in the event of the course being cancelled. If you prefer to pay via bank transfer please contact Odette. Also available Private Group Training in the workplace – minimum of 4 participants. Please contact us for details. Quality of overall service = 10/10 How likely are you to use our services in the future? = 10/10 Definitely! How likely are you to recommend our services to others? = 10/10 Definitely My group thoroughly enjoyed the laughter session. Both coaches brought great energy, paired with new and exciting information. We look forward to having more laughs in the future!